I am often asked what is the best Kundalini meditation to start with and so I thought I would take the time to combine my 3 of my favorites. I suggest you try all 3, and then pick 1 or more and continue on for 40 days. Don’t Skip a day. I feel it is the most powerful to do it first thing in the morning, but do it when it is best for YOU. I just say, complete it before midnight each day. Posture:Sit in Easy Pose with a straight spine. Breath: Close off your right nostril with your right thumb and inhale deeply through your left nostril. Exhale completely through your mouth. Time: Continue for 6 minutes. 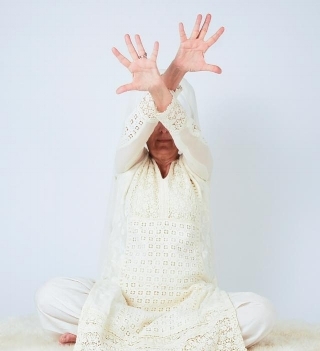 To End: Inhale deeply, interlace your fingers and stretch them over your head palms up. Hold your breath for 10-15 seconds while you stretch your spine upward. Exhale and relax. Mind can take you into any thought, beyond thought, and unto Infinity. Mind can take you into any dungeon, any pit, and any negativity. Mind has no limit in its own self. But mind is your servant. If the mind becomes your master, you don't have a chance. It is very essential in yoga that we know our own mind. This was the first Kundalini Meditation I taught and it was to Gabby Bernstein’s Level 2 Coaching students. They all loved it and still write to me telling me how much they enjoyed it and how much it changed their relationship with prosperity! The audio file, includes music and the cues for when to switch meditations...Enjoy! Then a 3 minute WARM UP of cat cow going as fast as you can. This is good to lubricate the spine, and move the energy. It adjusts the spine, strengthens the nervous and reproductive systems, and brings the emotions into balance. It also helps to move energy up the spine to the upper Chakras to enhance meditation. 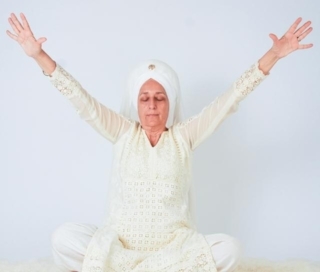 It is one of the most common things to do during morning mediation, to wake up your spine and your Kundalini energy, for vitality all day long. The cat cow is not part of the mediation, but a nice way to warm up. I will also call out when it is time to change. Please feel free to email with any questions. This is a five-part kriya. Each part must be practiced for an equal amount of time, either 3 minutes or 11 minutes. Do not exceed 11 minutes. Only Meditation #1 can be practiced on its own, separately from the other exercises. Practice this for 40 days and do not miss a day. Eyes: should be nine-tenths dosed, focusing on the tip of the nose. Movement: Stretch your arms up sixty degrees. Open your fingers, spreading them widely. The fingers have to be totally hard, cross your arms alternating right over left and then left over right, still keeping the fingers stretched open. MOVEMENT Watch. You know this id, the thumb? Put them both in your fists and press as hard as you can, like you are going to squeeze the blood out of them. Press, press, press hard. Arms at sixty degrees. Move the arms in small backward circles. Press the id. Press, press, press hard. With each circle you make of your arms chant "God." Chant "God" powerfully from the navel. MANTRA Har Haray Haree, Wahe Guru. The mantra is a sound current through the tongue and upper palate. Har Haray Haree, Wahe Guru (Wahe is pronounced "wa-hay"). Continue chanting in a low monotone. MOVEMENT The right hand goes up and the left hand goes down; palms facing the body; hand cross each other.) Right hand closer to your body. MOVEMENT AND BREATH Put your arms at shoulder level, left hand under, right over. Breathe long and deep. Don't let the hands fall. They should be parallel to the ground; that' the law. Keep your spine straight; sit correctly. Do nothing; just breathe one breath a minute: 20 seconds to inhale, 20 seconds to hold, 20 seconds to exhale. If you can’t do 20, 20, 20, then do 10, 10 10 or 5, 5 5. This is a complete set. It is called Sobagh Kriya. This is often what I suggest to most people to start with. You can feel the difference in your nervous system immediately! I made an audile file that includes calling you in, and taking you out, You will follow along with the song, saying it out loud at first, then whisper, then silent, then whisper, then out loud. If you enjoy the ritual and meditations that I share, I invite you to join me and a small group of like minded souls to go a little deeper. Holidays can be stressful and I thought it was a perfect time to offer a little more support and guidance. This will be a very small group (there are only a few spots left) and everyone will have the opportunity to be heard from. This is not something you will want to miss. And for Black Friday you can get 20% off by using code GRATEFUL on the group. Are destructive emotions and negative energies holding you back from living each day in peace, passion, and love? Do tensions, thoughts, and emotions make every day feel like an emotional rollercoaster you'd like to step off of? Do you want tools that you can always turn to to take your thoughts in the right direction? If you answered yes to any of these, here is your reminder that you don't have to go through the holidays alone with your stress. THERE ARE ONLY A FEW SPOTS LEFT TO Shift Your Consciousness. If you’re ready to unblock and release patterns that have been holding you back and want a little extra guidance, I would love to see you in New York City in person, or virtually anywhere Schedule a time here. Looking forward to connecting!